The Yamato, WW II's largest ship at 72,800 tons carried nine 18" guns. 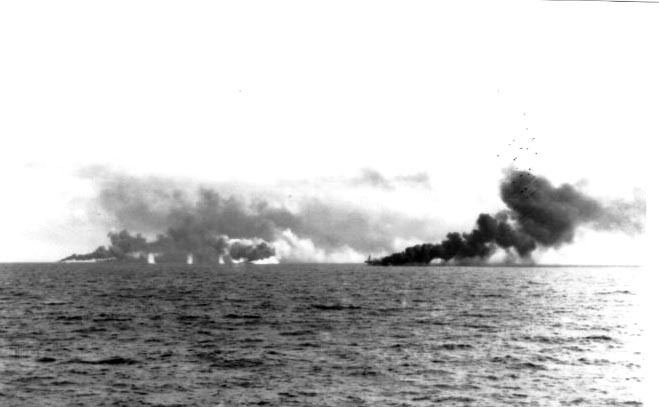 She was sunk on 7 APR 1945 in the Sibuyan Sea by aircraft of TF 38 in a battle off Okinawa. 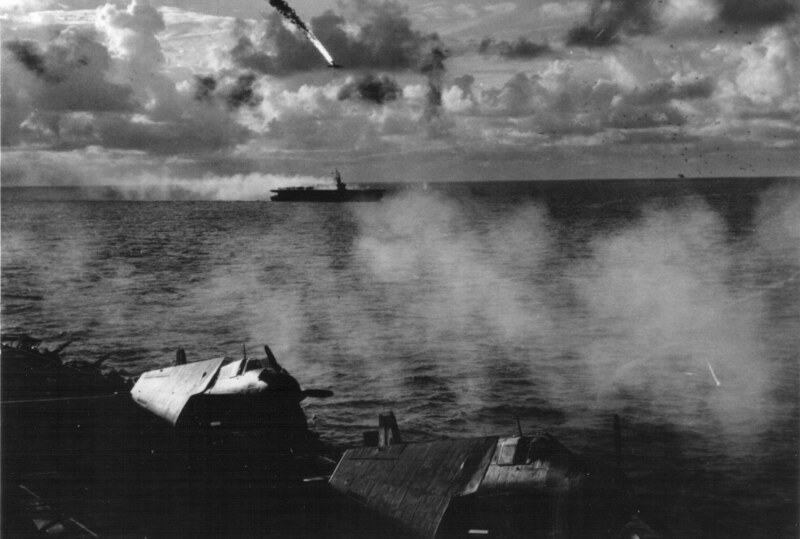 After being hit by a Japanese Kamikaze, the USS St Lo, a CVE, explodes as seen from the USS Kalinin Bay, ENS Buchanan's ship. 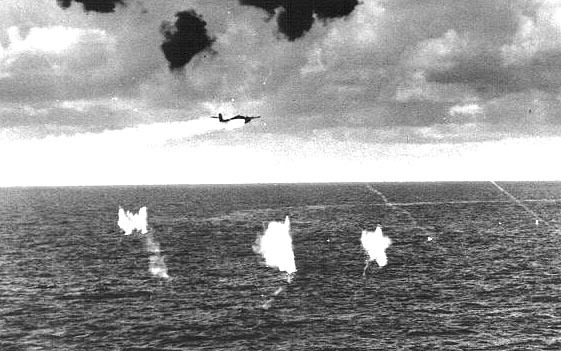 The photos record a few of the combat actions flown by Composite Squadron Three (VC-3) off the USS Kalinin Bay, CVE-68 off of Siapan Island in the Marrianna's JUN 15-16, 1944, noted by Group "A". This action was also referred to as the "Marrianna's Turkey Shoot". 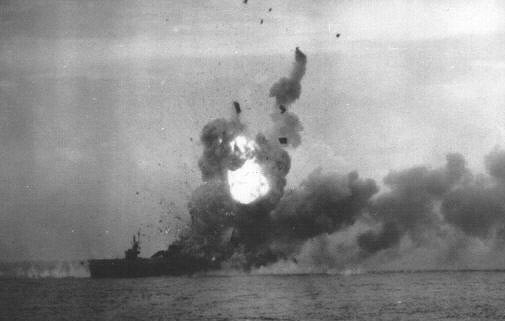 And Group "B" pictures, record a few events during the Battle of Leyte Gulf, OCT 24-25, 1944. 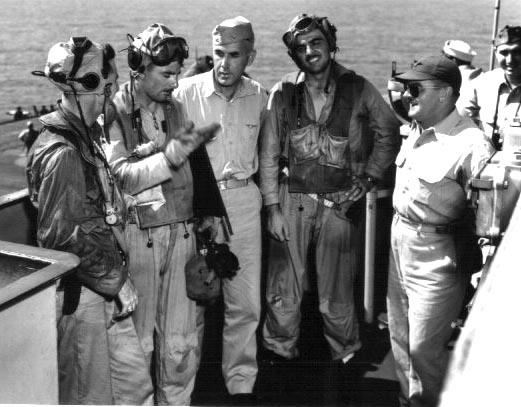 From left to right: ENS John E. Buchanan, LT Ken Hippe, debrief with CAPT T.B. Williams, CO, of USS Kalinin Bay, CVE-68 with LT Jg Volpi, and CDR Cromwell, Air Officer, looking on. 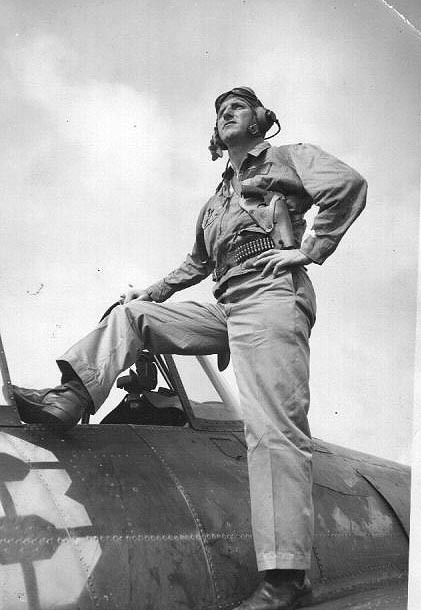 CAPT Williamson, is congratulating the group for having shot down 19 out of 21 enemy planes over the island of Leyte on 24 OCT 1944. Williamson later advanced to 4 Stars and was Commander of the 6th Fleet. ENS John "Buck" Buchanan and his Grumman FM-2 Widcat fighter aboard the Kalinin Bay somtime in 1944. Buck is a neighbor and close friend of the editor of FLIGHT LINE. 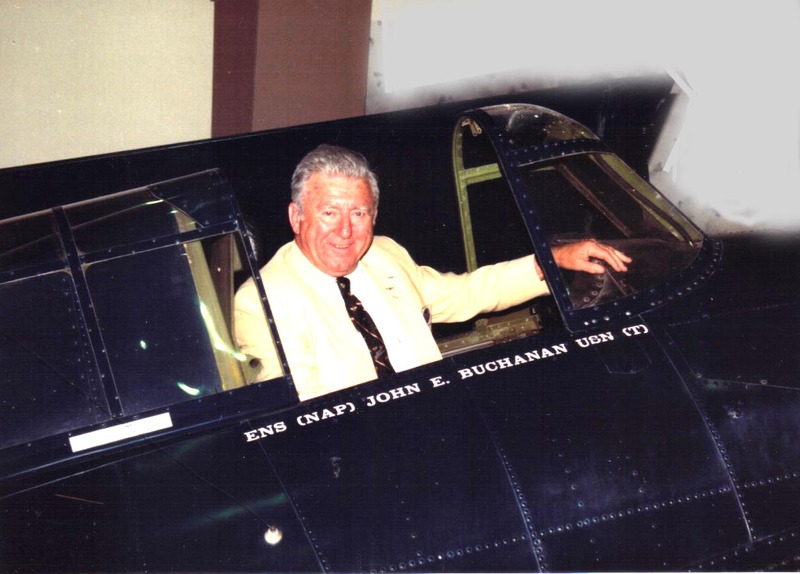 ABOVE: Today, Buck's own fighter, now hangs in the artium in the National Museum of Naval Aviation in Pensacola, FL. 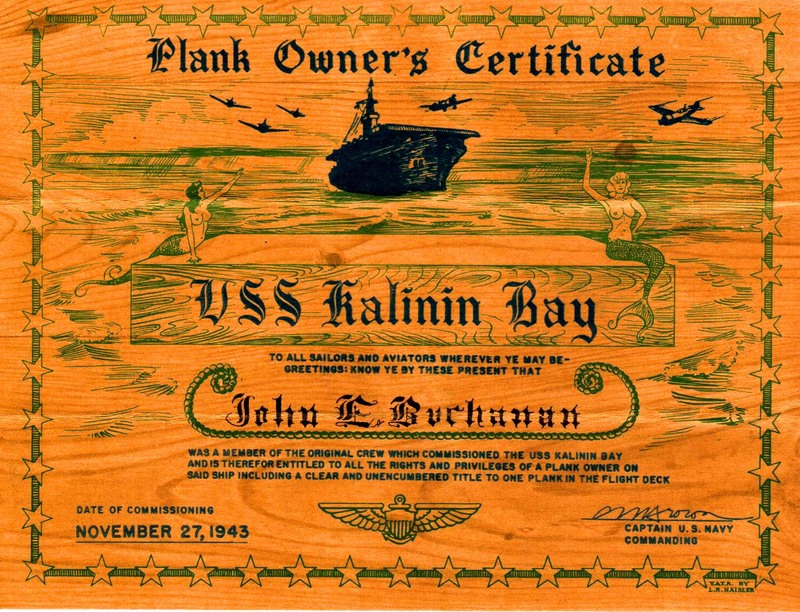 BELOW: Certificate dated 22 NOV 1943 and signed by the ship's original commanding office, CAPT C.A.T. 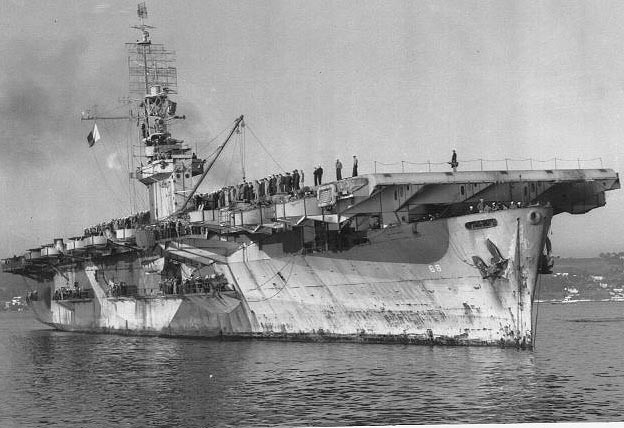 BROWN, USN. CAPT "Cat" Brown was promoted to VADM during the course of the war, and his successor, CAPT Williamson, (see above) made ADM.